The New York Declaration for Refugees and Migrants is a milestone for global solidarity and refugee protection at a time of unprecedented displacement across the world. Adopted by all 193 Member States of the United Nations in September 2016, it contains historic and wide-ranging commitments that reaffirm the commitment by Member States to respect the human rights of refugees and migrants and to support the countries that welcome them. As mass displacement across the world continues to grow, it is usually low- and middle-income countries that shoulder much of the responsibility for refugees. Meanwhile, the world’s response to large-scale movements remains inadequate and underfunded leaving refugees with an uncertain future. The New York Declaration lays out a vision for a more predictable and more comprehensive response to these crises, known as the Comprehensive Refugee Response Framework, or CRRF. It calls for greater support to refugees and the countries that host them. At the heart of this approach is the idea that refugees should be included in the communities from the very beginning. When refugees gain access to education and labour markets, they can build their skills and become self-reliant, contributing to local economies and fuelling the development of the communities hosting them. Allowing refugees to benefit from national services and integrating them into national development plans is essential for both refugees and the communities hosting them, and is consistent with the pledge to “leave no one behind” in the 2030 Agenda for Sustainable Development. In the New York Declaration, Member States recognize that refugee camps “should be the exception,” and a temporary measure in cases of emergency. Instead, refugees should be allowed to live among host communities. By helping refugees thrive, not just survive, we can reduce the risk of protracted stays and lessen refugees’ dependence on humanitarian aid. Foster conditions that enable refugees voluntarily to return to their home countries. 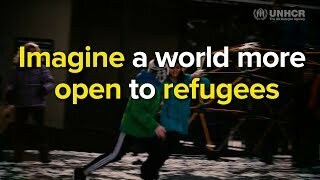 This new approach envisions a world where refugees have access to countries where they are safe, where they are better included, where they are no longer living in camps, and are not dependent on humanitarian assistance only. The Declaration recognizes that when refugees are given the chance, they can support themselves and their families, and make positive contributions to the communities hosting them. In this virtuous cycle, refugees and host communities mutually empower each other, socially and economically. The New York Declaration spells out UNHCR’s role in this process, calling on it to “develop and initiate” comprehensive responses in different countries and regions where refugees are hosted. To facilitate this multi-stakeholder process, the High Commissioner has appointed a Task Team composed of staff of UNHCR as well as staff seconded from other UN Agencies, international organisations and NGOs. Afghanistan, Chad, Djibouti, Ethiopia, Kenya, Rwanda, Uganda and Zambia have each agreed to apply the comprehensive framework. It is also being applied to the Somalia situation, requiring the involvement of Somalia’s Government and its neighbours in a regional approach. Countries in the North of Central America, namely Belize, Costa Rica, Guatemala, Honduras, Mexico and Panama are also applying a “comprehensive regional protection and solutions framework” to address forced displacement issues in the region. To maximize results, these countries require additional financial support as well as new and innovative partnerships. At the Leaders’ Summit on Refugees, which took place the day after the New York Declaration was adopted, 47 States committed to delivering concrete changes to help refugees thrive. Some commitments include legal and policy change, such as providing refugees with enhanced access to education, lawful employment, and to existing social services in the countries in which they live. Other commitments consist of increased multilateral humanitarian assistance and development aid, as well as expanded access to third country solutions, such as resettlement and complementary pathways. At the end of 2017, UNHCR and its partners will assess the application of the comprehensive response in these varied contexts. The lessons we learn will inform the preparation of the global compact on Refugees, which the High Commissioner will include in his report to the UN General Assembly in 2018. For more information, please see the dedicated pages on the global compact on refugees and the New York Declaration.